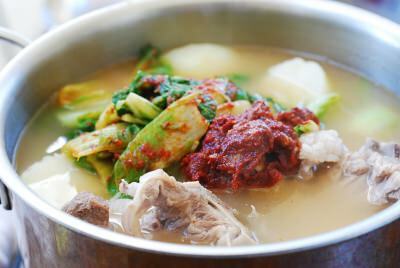 Gamjatang (감자탕) is a spicy, hearty stew made with pork bones. Gamja (감자) is a Korean word that’s more commonly used for potato, but for this dish, gamja actually refers to a part of the pork spine. Honestly, I didn’t even know this until I started researching the origin of gamjatang for this post. Well, we learn something new every day! 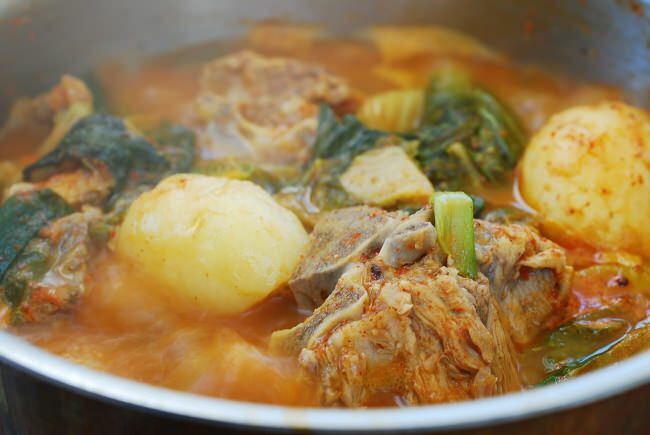 Ironically, this stew traditionally includes large chunks of potatoes, gamja, so I am sure most Koreans think that’s where the name of the stew came from, probably wondering why the potatoes in the dish seem extra rather than the main event. Indeed, this dish is all about pork bones! 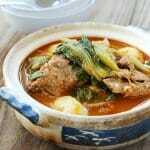 They are used to make a deeply flavored, milky stew base, and the attached meat is fall-off-the-bone tender and delicious. 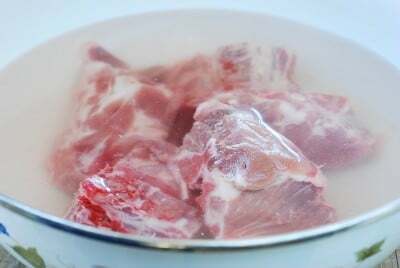 You will need to soak the pork bones to remove excess blood, then briefly cook the bones in boiling water and discard the water to further remove the impurities from the bones. Then, boil the bones with the aromatic vegetables until the meat is tender and the broth is milky. A similar technique is used in galbitang and seolleongtang. 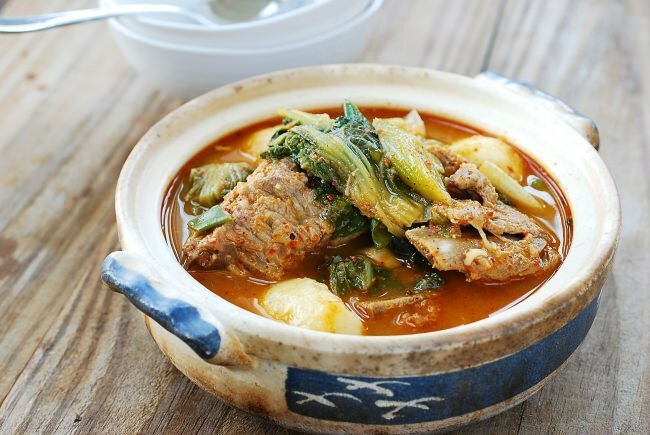 You can make this stew simply with pork bones and potatoes, but boiled napa cabbage or young cabbage (putbaechu, 풋배추) is also commonly added. 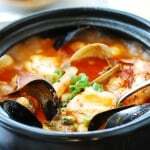 The stew is flavored with typical Korean condiments such as doenjang (Korean fermented soybean paste), gochujang (Korean red chili pepper paste), and gochugaru (Korean red chili pepper flakes). 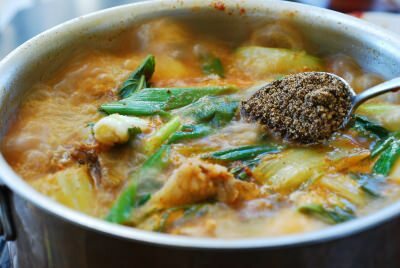 However, it also calls for crushed perilla seeds (ddeulkkaegaru, 들깨가루) and fresh perilla leaves (kkaennip, 깻잎), which gives the stew distinct nutty flavors. I know you probably don’t want to buy crushed perilla seeds just for this one recipe, but it can be used as a substitute for sesame seeds in many Korean dishes, especially in namul dishes or bibim guksu. Soak the bones for an hour or longer in cold water. Change the water half way through if you can. Drain. Bring a medium pot of water to a boil. Drop the bones in. Let it come back to a boil. This will take about 7 to 8 minutes. Drain the bones. Wash the bones under running water. Clean the pot. Return the bones back to the pot. Add 8 cups of water, the onion, garlic, ginger and scallion. Bring it to a boil. Continue to boil, uncovered, for 10 minutes over medium high heat. Reduce the heat to medium low. 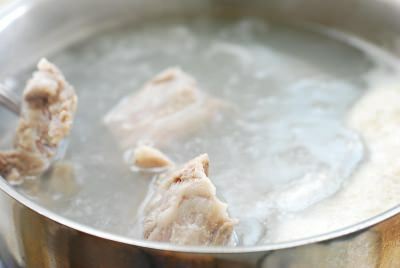 Continue to boil, covered, for 50 minutes to an hour until the meat is tender and the broth is milky. Mix the seasoning ingredients well together. Bring a medium pot of water to a rapid boil. Blanch the cabbage until the white parts turn soft, 4 to 5 minutes. 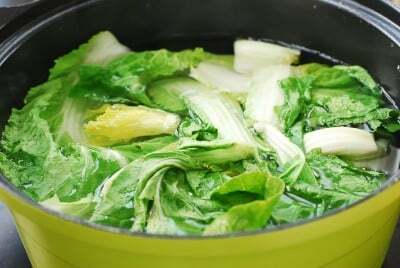 Remove the cabbage from the pot (keep the hot water to boil the potatoes) and shock in cold water to stop the cooking. Drain and squeeze out water. Cut into 2 to 3-inch lengths. Mix the cabbage well with 1 tablespoon of the seasoning. 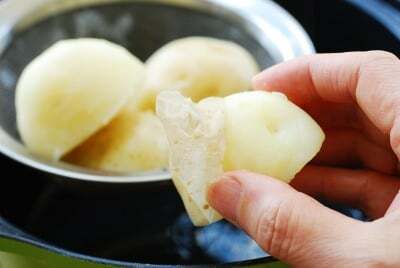 Cut the potatoes in half with the skin on. In the pot of water used to blanch the cabbage, boil the potatoes until almost cooked. Peel the potatoes. 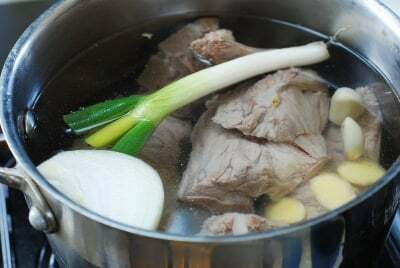 Remove the meat from the broth. 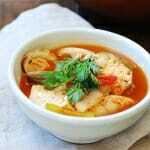 Discard the aromatic vegetables, reserving the broth (about 5 cups). Place the bone back in the pot with the broth. Add the cabbage, potatoes, and the remaining seasoning. Boil for about 10 minutes. Throw in the perilla leaves and scallion. Add salt and pepper to taste. Boil for an additional couple of minutes, and then add the crushed perilla seeds. Hyosun, I love your blog! 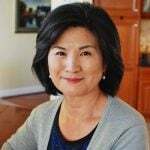 I am a Korean American (mother was full-blooded Korean) who really enjoys all of your recipes. They all bring back wonderful memories of my childhood and keeps me connected to my mother who passed away in July 2010. I tried to learn everything she cooked by watching and asking questions, but your recipes are so thorough with the ingredients and directions. Thank you so much for keeping the Korean culture alive! Teresa – I’m sorry to hear you lost your mom years ago. I am happy to be helpful! Thanks for the nice words. I always thought a dish like this can only be enjoyed at a specialty Korean restaurant, but this dish I made from your recipe turned out to be fantastic. I think it is the best Gamjatang I had so far. My wife liked it a lot too. Thanks for your wonderful recipes. They are precise and well written, and most importantly they are really good. I made this yesterday.. It was delicious, my husband also loved it. May I know if I can replace the perilla seeds with other ingredients? And what will happen if I just omit it out? You can omit it. It will still be good. If you can find perilla leaves, use lots of them.Hope you make it. 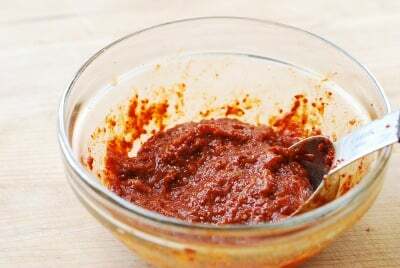 I remember the first time I ate gamjatang, I was sweating and my lips burning because of the rich spice. It was somewhere in Deagu. One that I also love is the chicken soup, samgyetang. 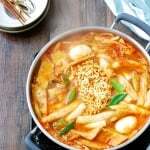 Hi Hyosun, I am planning to make this recipe very soon. Have you ever made this using a pressure cooker? I’d like very much to cut the cooking time but I was just wondering if the results will be ok if I use a pressure cooker. Thank you! I haven’t, but I am sure it will work. Try it and let me know. Hope it turns out well. Is there a substitute for perilla leaves? That’s the only ingredient I couldn’t find. Just omit it. The stew will taste still good. Enjoy! Thank you for the quick response Hyosun. I ended up substituting perilla leaves with mint leaves. Great recipe, thank you for sharing. 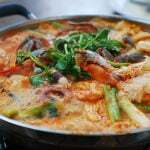 I LOVE Korean food!Thank you for sharing your recipes with us! 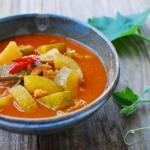 How could I adapt this recipe for cooking with the Instant Pot? 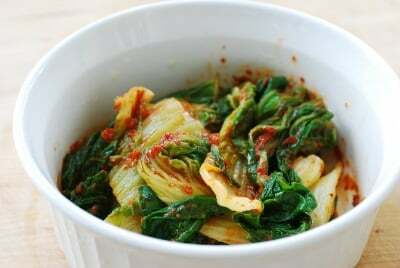 You can, although baby bok choy will not give the flavor of perilla leaves that’s typical in gamjatang. I’m sure it’ll be still delicious. Thank you Hyosun, I appreciate you getting back to me. I will use the perilla leaves. 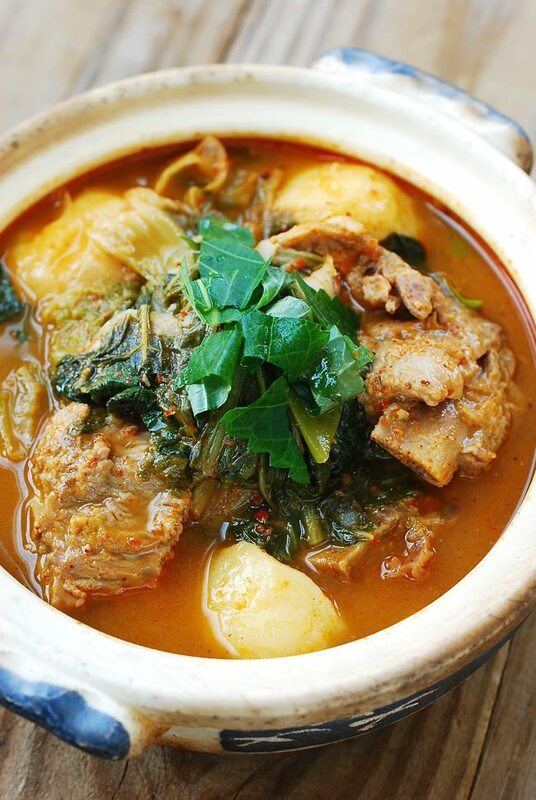 Gamjatang traditionally is pork bone stew, but of course you can try it with chicken. It’s just going to be different but I’m sure it will still be delicious! I had to substitute some ingredients, and thoroughly enjoyed the results! Thank you. You’re welcome! Glad you were able to substitute some ingredients. Hello Hyosun, thank you so much for all the recipes you are sharing. 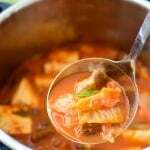 I am a Filipino living in the USA but I love Korean cuisine very much. In some of your recipes, one of your ingredients is “perilla leaves”. Is there any kind of substitute for this? Thank you so much. You can simply omit it.